I was poking fun at Batman in my post from last night, and Frank took that as a sign that Batman was destined to be covered on this blog. 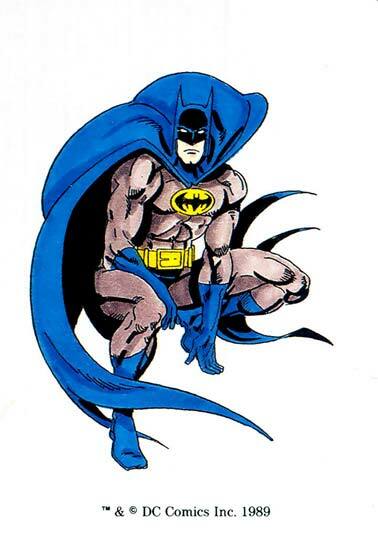 I am a pretty big Bat-fan, after all. First off, a shoutout needs to go to Tom Hartley, who sold Frank his Mayfair RPG card set for a very fair price, I'm told. I didn't get to thank either of them yesterday for their part in this. So thanks, guys! Let's take a look at Bruce's stats, shall we? 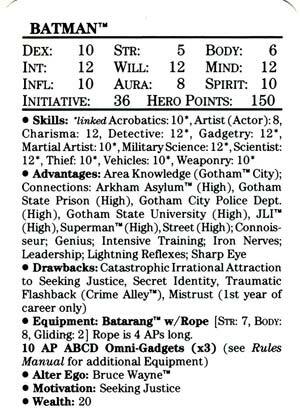 Never one to miss a stray detail, DC made sure Bruce's stats reflect even his most eccentric hobbies, like his stint in Gotham Community Theater when he once danced Puck in A Midsummer Night's Dream. You don't get an Actor stat of 8 without a little greasepaint. The folks at Mayfair also made sure to factor in Bruce's time spent as a juvenile deliquent immediately following the death of his parents by giving him a Thief stat of 10. Yes, he swore to avenge them, but not without keying a few Studebakers, hassling a few soda jerks and knocking off a Walgreen's here and there. What, you think a rich, privaleged, well-balanced guy like Bruce Wayne doesn't commit crimes and act like a jerk in his spare time? Oh, the evidence is here, my friends, and it is hilarious. Let it also be noted that the Bat Rope (TM) is only the length of 4 A&P stores put end-to-end, and that could be a drawback when chasing Man Bat up Wayne Towers, which is about 6 A&P's in height. I guess that's where an Advantage like having Superman (TM) as your personal peon comes in handy. And, like I predicted yesterday, Bruce Wayne's Wealth stat is indeed 5,000,000. That means he'll win any battle, becuase money always trumps intelligence, brawn, and sheer brute strength in any fight. Don't you remember that part in Final Crisis where Batman dropped a couple hundred Ben Franklins in front of Darkseid and said, "Dance big man, dance!" and then Darkseid sent Bruce on a lovely little vacation back in time to show his appreciation? That's also the reason why Darkseid is such a pimp. Damn it! I chose you as my new Bat-Sidekick so you wouldn't show me up! Even your one-liners are better than mine! Go cure cancer, why don't you? This is really stunning work.Thanks for this kind of stuff. I wanna say I am totally impressed.Hope to see some more update work here. I have to say it is quite informative. Why no one uses the statistics of the third edition?